It’s a gas, gas, gas!! Well, it’s now getting really exciting! The Hubster is due back today, he’s been visiting his family. As soon as he gets back we will be seriously getting Harry sorted so that our adventure can at last start. I must say, staying with my sister all this time has been so cool, she’s a great sister and friend and of course living in a real house has been superb, a real bathroom, hot and cold running water as and when needed not to mention electricity. I think it’s going to take us a while to get back into the Motorhome way of living!! 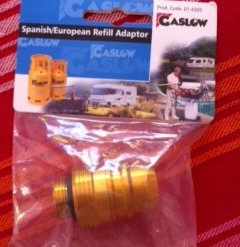 Before leaving the UK we had a Gaslow system fitted to Harry, at a fair old cost but we think it’ll be worth it. When we got Harry he had a locker on the outside of the van which contained two large, blue, Calor Gas bottles which fuel the heating, the hot water, the cooker and of course the fridge when we are parked up. Unfortunately in most of Europe they don’t have Calor Gas bottles and so we have fitted a refillable LPG system, we still have two bottles but they are yellow, there is a valve on the outside of the locker door and the gas is filled up at an ordinary petrol station. Not all Petrol stations have LPG pumps but so far we’ve seen loads so we’re hoping we won’t run out!! LPG is so much cheaper than gas bottles so hopefully we will get our outlay back eventually! We pulled up at a service station on the motorway on our way down to Brittany and decided to fill up for the first time with LPG. We parked up in the little ramps next to the pump and decided to do this ‘a deux’ one to read the instructions and the other to do the job in hand. I did the reading, “Looks easy,” I say “ just attach the nozzle to the valve and press the handle to fill” I had read somewhere that there is a hissing burst so I warned the Hubster so that he would be prepared. Fitting the nozzle to the valve was our first and in fact our only problem, they didn’t fit together!! Great – so no we didn’t fill up with LPG!! One day, we were shopping at the local out of town shops and there parking up, was a massive Hymer, with, believe it or not, UK registration plates. I shot across the car park, like a woman demented, dodging the French motorists, who had one thing in mind, run over an English tourist! I apprehended the driver of the motorhome and hit him with a barrage of questions! He was so helpful, to be honest a little too helpful, I couldn’t stop him, he gave me the ins, the outs and the roundabouts to all known gas systems for motorhomes! Armed with the information he’d given to me (well the bits I’d remembered at least) I told the Hubster what we needed. Not one, not two but three adaptors, which would cover all eventualities!! I think someone, somewhere has worked out there’s money to be made here! 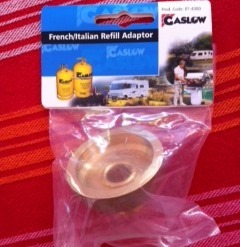 The boys went off to the local camping accessory shop and the man said he could order the French adaptor for 132 Euros!! (that was just for one!!) and he wouldn’t be able to get it in stock before the end of September! Oh no, this didn’t look good, thank heaven’s for the internet within an hour we had ordered all three adaptors from the UK to be posted to France and it cost the grand sum of £50! So we have all we need to fill up with LPG – it’ll be good to get used to using it, putting the boiler on for hot water for the shower and for washing up of course. I’ve noticed that even though we have glorious sunshine during the day, in fact today is about 25°, the mornings are very chilly as are the nights, so I’m guessing at some stage we’ll need to put the heating on in Harry. So little by little we’re getting things sorted. I’ve been quite amazed at how relaxed we’ve been about getting all the systems up and running. Normally we’d be rushing around and making sure everything is tickety-boo but we seem to have chilled out so much that nothing seems that important! Watch this space, things are hotting up!! 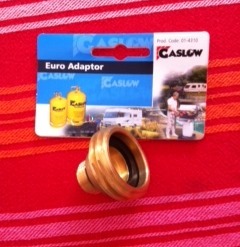 This entry was posted in Daily life, Hidden Gypsy, Hymer, motorhome, motorhoming, Photos and tagged Gaslow system, hidden, Hymer, Hymer B564, motorhome, Motorhome gas system, motorhoming, motorhoming in France. Bookmark the permalink. We were driving along the other day and there was a huge waft of manure and I actually found myself saying Oh isn’t that lovely!! I don’t think it was particularly lovely but it did bring back loads of childhood memories!! !